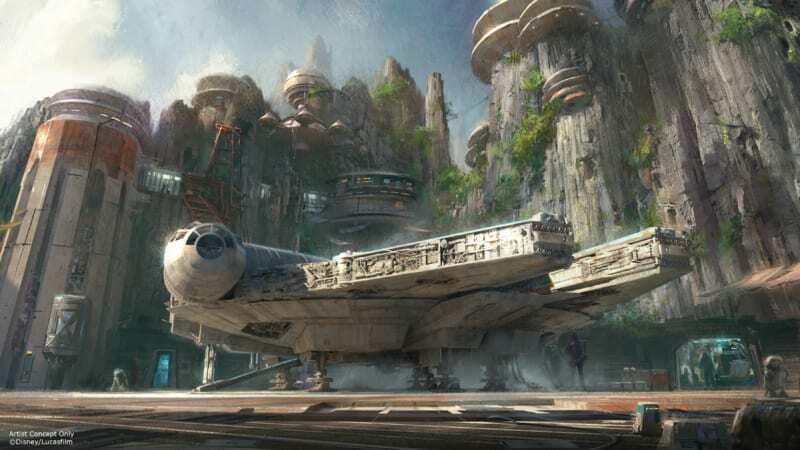 Since it was announced in 2015, the entire theme park industry has been eagerly anticipating the answer to one question: When is Star Wars Galaxy’s Edge opening in Disneyland and Walt Disney World? The hype for both locations (in Disneyland Park and Disney’s Hollywood Studios) is off the charts and we’re going to show you how to make reservations and just how to get into this new land! (UPDATED 4/22/19): Disney has announced that guests staying at a Disneyland Hotel will be sent an email with instructions today, April 22, 2019 on how to book their reservations in Star Wars Galaxy’s Edge. Guests with a valid hotel reservation at one of the 3 Disneyland Resort hotels during the period of May 31-June 23, as well as theme park admission will receive a designated reservation to access Star Wars: Galaxy’s Edge during their stay. Free Reservations – They also gave us info about the free reservations for Galaxy’s Edge including that specific details on how to make reservations will be available on the Disney Parks Blog and Disneyland.com on May 2 at 8 a.m. PT. It’s important to note that you must have a Disney account to register for a reservation so be sure to create one before registration opens at 10 a.m. PT. Guests will be made to leave Galaxy’s Edge once their time slot is up. They didn’t explain how it will work, but they will be required to leave. Guests will not be allowed to exit and reenter Galaxy’s Edge, so if you leave you won’t get back in. You only have ONE reservation per stay. You won’t be admitted into Galaxy’s Edge on multiple days. We’re continuing to update this post so it will be a valuable resource for you to understand all the latest details necessary to make it into Star Wars Land! 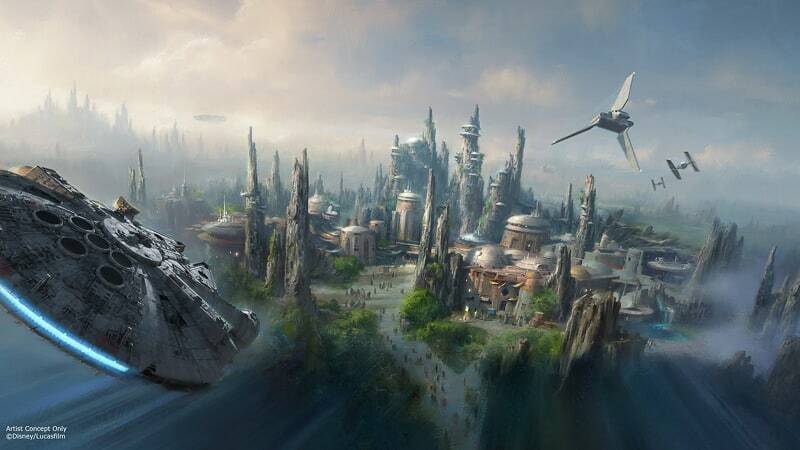 Just in case for some reason you aren’t familiar with Star Wars Galaxy’s Edge, it’s a brand new land coming to the Disney Parks which will fully immerse guests into the Star Wars universe, transporting them to a small outpost on the outer rim of the galaxy called: Batuu. 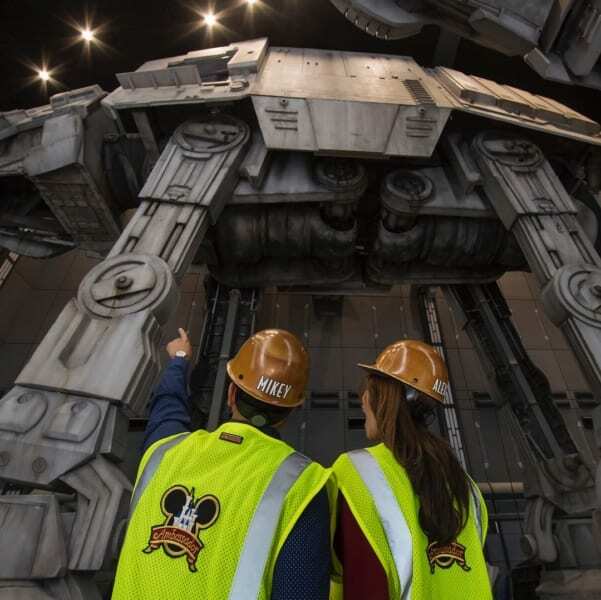 Disney is putting everything into this project and so much of the company’s future theme park success is riding on Galaxy’s Edge, and they are pulling out all the stops to make it unlike anything anyone has ever experienced before. There are going to be two attractions, one based on the iconic spaceship the Millennium Falcon (Millennium Falcon: Smuggler’s Run) and the other putting you right in the middle of a battle between the First Order and the Resistance (Star Wars: Rise of the Resistance). There are also going to be 2 restaurants (at least one with some entertainment components), numerous and uniquely styled shops, and so many other hidden areas to explore that Disney promises us it will feel like really going to another galaxy. 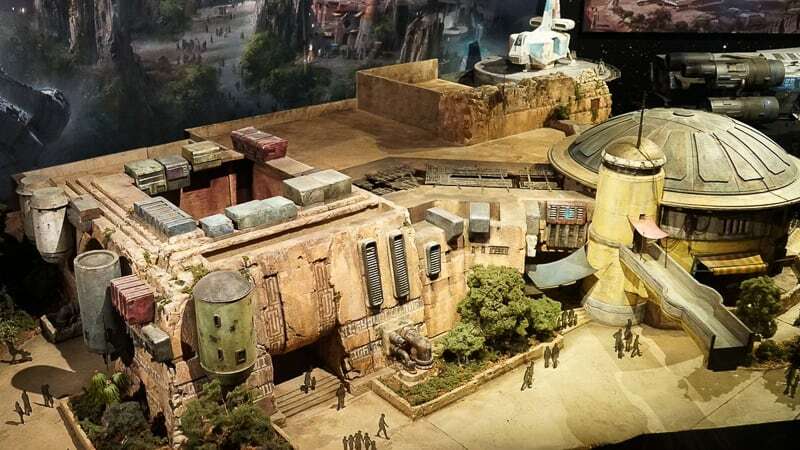 Just recently Disney dropped a whole bunch of new information about Star Wars Galaxy’s Edge including a detailed look inside both new attractions: Star Wars: Rise of the Resistance and Millennium Falcon: Smuggler’s Run! It’s no wonder these attractions could easily have 5-6 hour wait times each! 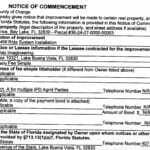 This question has been on the minds of fans for years now, as many families want to plan their next trip to either Disneyland or Disney World based around this exciting new land. The answer though depends which version of Galaxy’s Edge you are hoping to get into. This is a pretty big shock as I don’t think anyone was expecting to have a May and August opening! It’s a tremendous relief to finally find out when the opening is going to be because literally thousands of families have been waiting to book their next Disneyland/Walt Disney World vacation until they knew when Galaxy’s Edge is going to be open. 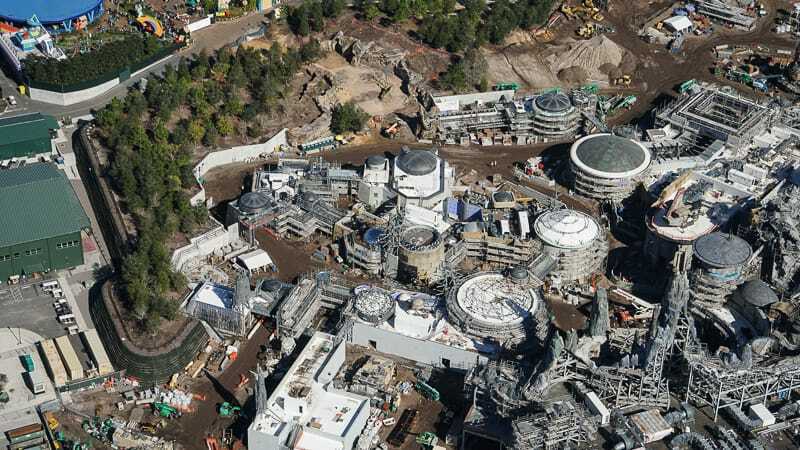 Access to Star Wars Galaxy’s Edge in Disneyland is going to be VERY LIMITED for at least the first month of operation. 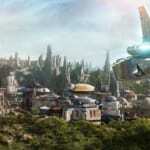 Disney has announced that guests wanting to enter Galaxy’s Edge between May 31, 2019 and June 23, 2019 will have to make a no-cost reservation to access the land and it will be subject to availability. Disney has made it clear there WILL BE NO STANDY-BY QUEUE to get into Star Wars Galaxy’s Edge during that first month. In other words if you don’t get a reservation then stay at home, or be happy to go on all the other wonderful attractions in Disneyland. It’s important to know however, that even if you do get inside Star Wars Galaxy’s Edge, your time there will be limited and you won’t be able to spend all day. As a way to allow as many people as possible to experience Galaxy’s Edge, Disney is going to give guests a time slot where they will come to be admitted and a time they will also have to leave Star Wars Land. Shifts will be in turns of 4 Hours each. We go more in-depth explaining the consequences of having Galaxy’s Edge as limited capacity, and we hope that Disney isn’t making a big mistake by making it this way. Again, as of now this is ONLY for the DISNEYLAND version. Though reservations will be required to enter Galaxy’s Edge in Disneyland from from May 31 – June 23, what happens when that period is over? Will things get out-of-hand with thousands spilling into Star Wars Land? Doesn’t seem that way. It looks like Disneyland is developing a virtual queuing system which will allow guests to avoid standing in lines that would be hours long just to get in to the land, and instead get into the virtual queue and be notified when their time slot to enter is ready. Most likely guests will make a reservation with the app on their mobile phone once they arrive to the entrance of Galaxy’s Edge. Entrance into the virtual queue wouldn’t be available outside the park but only when you get to the Galaxy’s Edge entrance, maybe with a scanner to your phone for example. Disney hasn’t given the official details of how this will work yet, but that’s the general idea. Also we will keep an eye out if this type of system will also be implemented in the Walt Disney World version as well. 1.) If you are staying at a Disneyland Hotel then you will be automatically granted access. Disney just released more info about this we know that ONE reservation will be given to each group staying at a Disneyland Hotel for access to Galaxy’s Edge. This reservation will be valid for your entire party and obviously you need to have a ticket to get into the park. The thing is, every group only gets one per length of stay, so even if you have 4 nights booked, you are only getting into Galaxy’s Edge one of those days. Disney hasn’t yet said which day during your stay you’ll be getting in, but I’m assuming it will be random. That means you won’t get to go in on opening day unless you are assigned that day. It’s also assumed that you have to be staying in a Disneyland Hotel on May 30, the night BEFORE Galaxy’s Edge opens to even be eligible for the opening (though Disney hasn’t confirmed that yet). 2.) Get one of the limited Free-reservations. Disney is going to have some kind of giveaway for Galaxy’s Edge entrances and anyone will be able to have the opportunity to get one (though I think it might be easier to get on a heart transplant list and find success than it will be to get a ticket to Galaxy’s Edge). We are still waiting on instructions on how to get these free reservations. As of writing, Disney hasn’t publicly stated how the system is going to work. They did recently make a blog post about it though and said that more details are coming soon, so keep checking back as I’ll post the instructions here as soon as we know! At this time it looks like it’s going to be much easier to get into Star Wars Land in Disney World than it will be in Disneyland because as of this writing, the Disney World version will not have limited capacity and guests will be able to queue up as normal. You will for sure have to wake up at a ridiculously early time no doubt, but if you get in line before the others, you will get access to Galaxy’s Edge. In some ways it’s better and some worse. If you are willing to sacrifice a bit of sleep (you can sleep when you go back home) then at least you’ll be able to guarantee yourself entrance. You also won’t have to worry about being kicked out of the land after a defined period like in Disneyland, you feel free to stay as long as you want and soak up all the Imagineer’s blood, sweat and tears over the last 5 years. On the other hand the crowds once actually inside the land are likely to be much bigger than in Disneyland with the reservation system, so you’ll probably be waiting a lot longer in line for the attractions. That’s going to make it much more frustrating for guests, let’s hope there are plenty of shaded spots to hang out in. If the Disneyland system works the way it should, it will actually cut down on the waiting times for guests inside, and most likely make for a better overall experience with less crowds. In that case there’s a chance we could see the same system implemented in Walt Disney World by August. Besides the reservation procedure and getting into Star Wars Galaxy’s Edge, there are some other factors to consider including that one of the two attractions, Star Wars: Rise of the Resistance will NOT BE OPEN for the opening of Galaxy’s Edge both in Disneyland, and in Walt Disney World too. That means Galaxy’s Edge will be opening in two phases, the first with the Millennium Falcon: Smuggler’s Run, and the second with Star Wars: Rise of the Resistance. Obviously this is pretty disappointing for whoever makes the trek out to either park, but since they are opening things so early and some technical difficulties they’ve had with the attraction, it means you’ll have to wait a little longer for what Disney is describing as the most ambitious ride they’ve ever built. Will there be Soft-Openings for Star Wars: Galaxy’s Edge? This is going to be next to impossible in both parks, and especially Disneyland. Things are coming down to the wire and Disney is sending every available construction worker just to get these lands out in time, so there won’t be any time for preview events, most of all in Disneyland. And even though Disneyland will have done most of the heavy lifting for Disney World by opening, they will be taking this down to the last day, and most likely in a similar way as with Toy Story Land, all the Annual Passholder previews, etc will be done at a later date sometime after opening. It’s obviously nice to have Star Wars Galaxy’s Edge opening sooner than we had originally thought, but at the same time I would have just liked them to wait till the whole thing was done and not give us something that’s only half-working. When Iger announced Galaxy’s Edge is opening on May 31, it was definitely shocking because I wasn’t expecting something THAT early. It makes sense for Disney though as a May opening means being ready for the Summer rush when crowds are at the highest, and will create mega publicity for the new land. Having a somewhat earlier than predicted opening in both places will also be good for cast members to get used to the crowds before the big holiday rush for Thanksgiving and Christmas which should make things run smoother. It would have been insane to open the Disney World version right in the middle of the busiest part of the year so I’m glad they were able to avoid it! 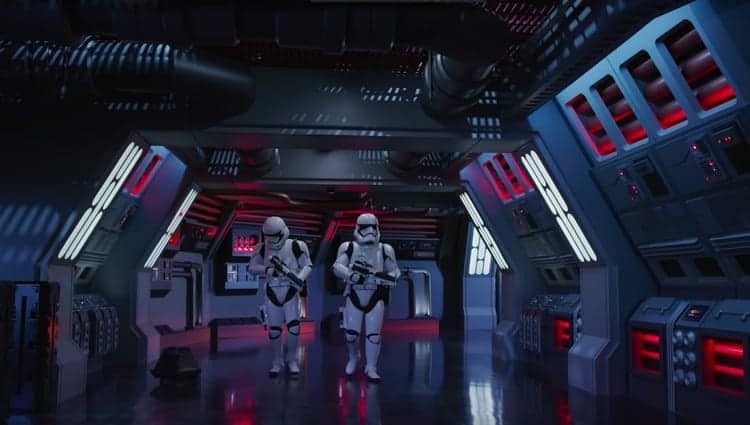 After giving some time to think about it, I think Disney is taking a bold and innovative move in implementing a reservation-only system to Galaxy’s Edge. I don’t know how many free passes they intend to give out or how long they plan on letting people stay inside, and that will make a big difference in how the guest experience comes out. How Long Should I Wait to go to Galaxy’s Edge? Of course people want to know right away if they should go immediately or wait until the crowds die down some. While I do think going opening day is just asking to suffer, you’ll have to get used to the fact that Disneyland is going to be absolutely packed every day for the next year easily. The lines for the attractions are going to be insane, and some are even anticipating 6+ hours wait times for the two attractions is possible, so get in line now! I also think between the two versions of Star Wars Land (Disneyland and Disney World), the Disneyland version is going to be the toughest to navigate. Disneyland is smaller than it’s Florida counterpart, and also this will be Disney’s first go at a land this advanced and of this magnitude. That spells lots of technical difficulties and general organizational issues are sure to happen. That said, if you are a Star Wars fan, or a theme park fan in general, I don’t think you can afford to wait a year to see Galaxy’s Edge, that would be torture and I for one wouldn’t be that patient to wait. Unless you are severely turned off by crowds, I say just tough it out and go as soon as you can. If it turns out to be half as good as the reports are saying, it will be worth it! 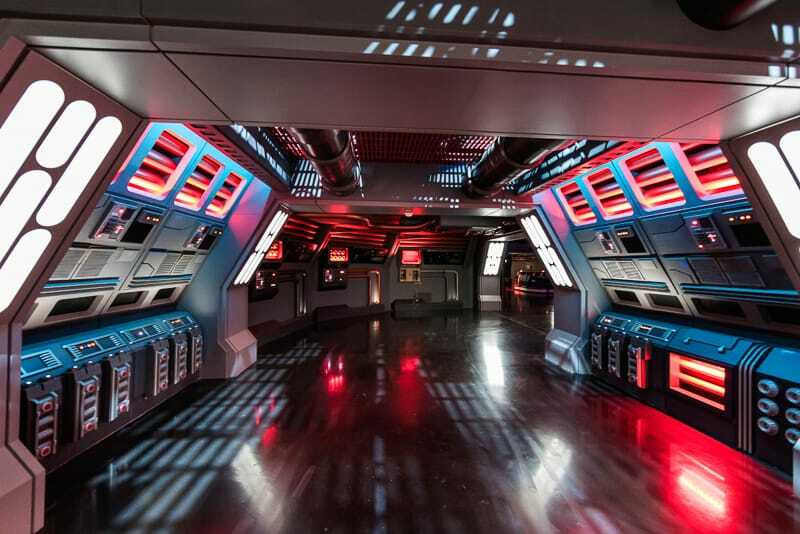 Just keep in mind that in both versions of Galaxy’s Edge, ONLY the Millennium Falcon: Smuggler’s Run ride will be open right away, so you’re going to have to wait for the Rise of the Resistance attraction. So if that is important to you, I’d wait a solid 3-4 months after the opening in either place to make sure it will be open, and even that is no guarantee. Should I go to Galaxy’s Edge in Disneyland or Disney World? 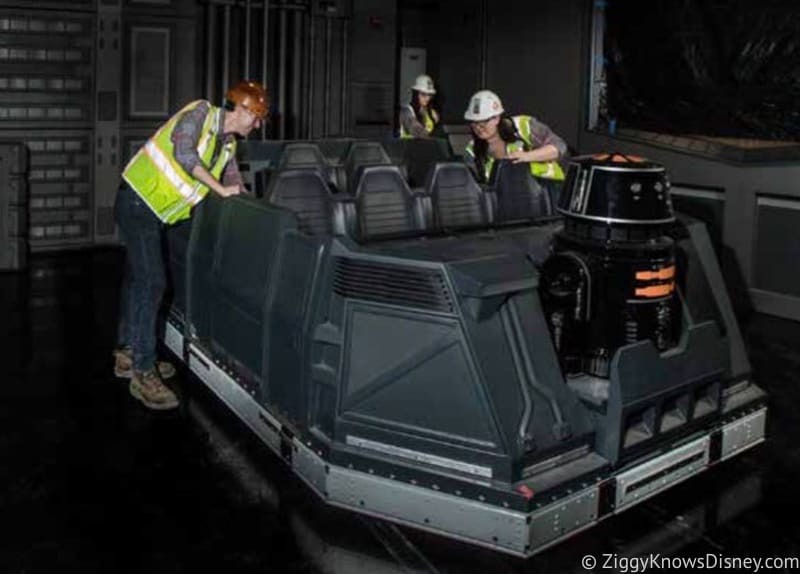 If you are trying to decide between going to Star Wars Galaxy’s Edge in Disneyland or Walt Disney World, you’re going to have to take into consideration many factors, but I think the better option is the Disney World version at this time. First of all, if you are planning to go during the first month of opening in Disneyland, if you don’t have a reservation then you might as well stay at home because your decision has already been made for you and you won’t have a choice. However that’s not the only reason I think the Star Wars Land coming to Hollywood Studios is the better choice to go to. Since it opens months after the Disneyland version, Disney will have operations worked out by then and they will be able to control crowds better. There will be less technical difficulties and overall things should just run smoother from the start. That plus the fact that with the initial “wow factor” happening in Disneyland, there’s a chance that some people who might have gone to the Disney World Galaxy’s Edge opening will decide instead to go to Disneyland. Don’t get me wrong, there will be massive crowds in Disney World for Galaxy’s Edge too without a doubt, but I believe that they will be slightly lower than in Disneyland throughout the next year. Also going to the Disney World version, you will have more time to explore Galaxy’s Edge without feeling like you are being rushed and have to get x, y and z done before leaving. I mean part of the beauty of this highly interactive place is just wandering and exploring, and I’m not sure you’re going to have the chance to do much of that in Disneyland. 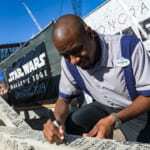 If you’re looking for more info on Star Wars Galaxy’s Edge you can read a sneak peak of the restaurants and dining in Galaxy’s Edge, the awesome costumes the cast members will be wearing, all the merchandise you can purchase like customizable droids and lightsabers, plus some killer animatronics for the attractions and the land in general. So those are our thoughts so far, we’ll have more soon so stay tuned here at Ziggy Knows Disney and we’ll continue to update you on everything Galaxy’s Edge! Are you going to the opening of either one? When do you plan on visiting Star Wars Galaxy’s Edge? Thanks for the update. Really cool news. Can’t wait. Hi Marion, I’m glad you like it. Should be fun! thanks for your comment, it’s one of the best I’ve had in a while!! 😁. I will be there with you and I totally agree it’ll be something we talk about for a long long time! !